Vinyl floors have come a long way. 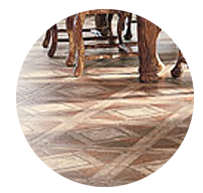 Today’s better vinyl floors feature aluminum oxide finishes, built-in silver to aid in cleaning, and built-in Scotchgard Stain Protection for even the most stubborn stubborn stains. In addition to Craft Rug Mills’ wide selection of in stock and special order vinyl floors, we offer professional installation by one of our trained and certified installers.